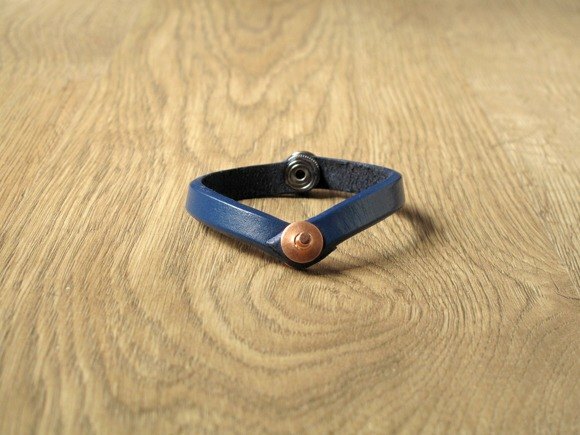 / Product description and story / Who said that the leather bracelet must be in line, Break the monotonous and dull rules, Unique "triangular" relationship Please support original. I hope to feel the persistence behind our design. “It’s not just about selling designs, it’s also sharing the insistence.” Made of high quality leather. With quality copper nails. Plus all the hands cut and carefully polished. / Dimensions/ Wide: 1cm, decorated with copper nails, and buttons for the switch. Length: Male is about 18-19cm. Female is about 17-18cm. * You can individually set the required hand cofferdam. * When ordering, please provide (the circumference of the pure wrist), (the recommended length of the work is 2.5 - 3cm, after the order will be followed up in detail) /Customized Service / colour Blue / green / pink / brown / dark / yellow / black https://farm9.staticflickr.com/8670/16041459954_a7fca58ec6_o.jpg Word style https://farm6.staticflickr.com/5598/15430766038_a04e6d35eb_o.jpg Customizable English words and numbers, please leave a "custom text" message to the message when placing an order. * The word style is larger than English/number - the upper limit is about 12 characters * Word style is small 楷 English / number - the upper limit is about 12 characters / Material / Thick leather (cow) Genuine Leather / 鞣 鞣 leather / Use and maintenance methods / This product is made of pure leather and is handmade. It is worn on weekdays and is very durable. The longer the leather, the more lustrous and the natural taste of the individual. With all-real leather, the texture of the skin and the depth of the color are all natural, so stay tuned. There may be slight chromatic aberration in the photo due to the difference in the display. Please refer to the actual product. Please be aware of friends who love to make leather goods and ride the style. / Designer and brand profile / Handmade By Back Discontent "BACK DISCONTENT" stands for a kind of "uncompromising" free and individualized attitude towards life. With the riding/rock culture as the main axis, the day will be carried with you. The leather will change according to your personal habits and experiences. To the level of daily life.